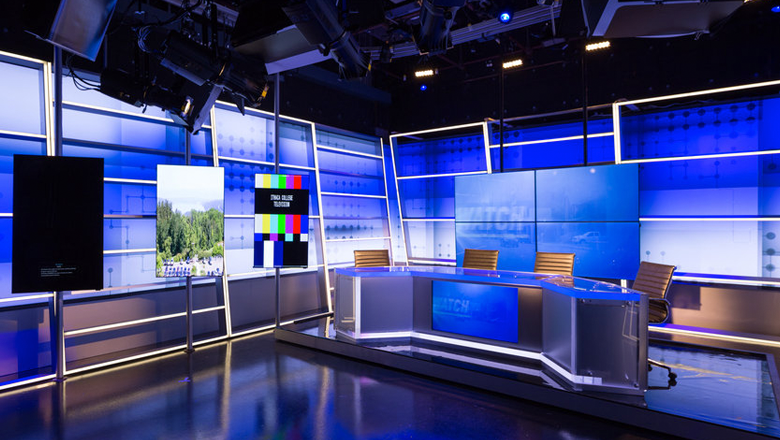 Ithaca College’s Roy H. Park School of Communications has debuted a new set that raises the bar for college TV station set design. The set, from Seth Easter, features a flexible layout that’s also designed to stand the test of time. The new studio layout centers around a four panel flat screen array behind the four person anchor desk. The studio walls, meanwhile, are outfitted with large printed graphic panels with monotone textures backed with color changing LEDs. Also prominently featured are wide frames with internal LED lighting that add structure and depth to the look. Scattered around the studio are multiple 55-inch vertical flat panels for standups, adding a wide array of additional reporting venues. The anchor desk itself features a 40-inch monitor, while the monitor wall itself is for 55-inch models. The school spent about $220,000 on the new set, according to its website, though it emphasizes that it will not only give students a professional grade environment to hone their on air skills, but will also play an important role in luring broadcast journalism students to the school. Overall, the look gives ICTV, the school’s news program, a polished and professional look and has certainly the set the bar high for college television stations, which often rely on hand-me-down sets from local TV stations. It was important to Ithaca College officials not only ensure this investment would be flexible enough to use for a variety of current and future programming needs, but also have a clean, modern look that would last well into the future. Working with Easter had a special meaning for Ithaca College. Easter is senior production designer at ABC News, which is home to Ithaca College alum and “World News Tonight” anchor David Muir. Easter’s latest project for ABC News included revamping the second floor of the “Good Morning America” Times Square studios. Ithaca College had been using modular set pieces that needed to be set up and torn down for productions of “Newswatch,” the college channel’s signature broadcast, as well as other programming the channel produces.